Ahi, or yellowfin, tuna steaks can make a delicious meal. Often compared to traditional beef steaks, this fish has a mild taste and a light texture. 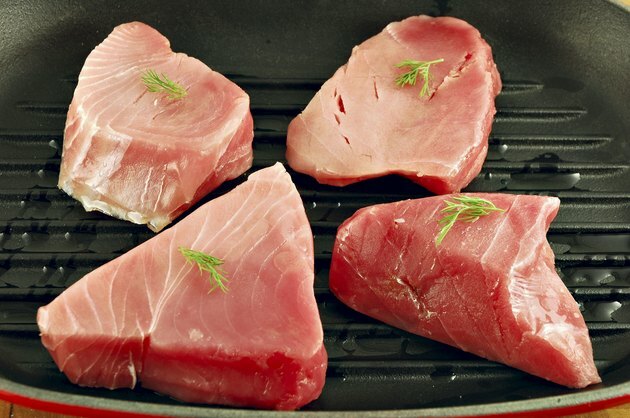 While ahi tuna can be prepared in the oven or fried on the stove top, grilling the steaks is a preferred cooking method because it highlights the fish's subtle flavors. As ahi tuna is best enjoyed medium-rare, you should buy only fresh, sushi-grade ahi tuna steaks. Different types of seasoning or marinades can complement the dish. Purchase fresh ahi tuna steak at your fish market or grocery store. The fish should not have a fishy odor and should be deep red or purple in color. Ensure that the ahi tuna is sushi grade since this type of fish is usually enjoyed rare. Slice the ahi tuna into serving sizes. Season ahi tuna with basic spices. Finely chop 2 tsp. fresh ginger root and sprinkle it onto the tuna steaks, and add sea salt and freshly ground pepper to taste. This will give the ahi tuna a slightly tangy, spicy flavor. Prepare a soy sauce marinade. Combine 1 cup soy sauce with 1/2 cup lemon juice. Include 1 clove crushed garlic, 1 tsp. ginger, and salt and pepper to taste. Place the ahi tuna into a shallow baking dish with the marinade and let the steaks soak for 30 minutes in the refrigerator. Ensure that you do not marinate the tuna for longer than 30 minutes as the soy sauce flavor can become overpowering. The citrus from the lemon complements the fish well. Create a honey-lime marinade to give the steaks a sweet citrus flavor. Combine the lime juice of 2 fresh limes with 1/4 cup olive oil, 2 tbsp. rice vinegar, 2 cloves minced garlic, 2 tbsp. cilantro and 1 tbsp. ginger in a bowl, and whisk. Season the ahi tuna steaks with salt and freshly ground pepper to taste. Use half of the marinade to cover the tuna in a baking dish. Soak for 30 minutes in the refrigerator. Add 1/4 cup honey to the remaining marinade and coat tuna as you grill or bake it. Prepare a "five-spice" mix to season the tuna with a smoky, spicy taste. To create this mix, place 2 tsp. Szechuan pepper, 2 tsp. black peppercorns, 2 tsp. coriander seed, 2 tsp. star anise and 2 tsp. fennel seed in a coffee grinder and grind for five to 10 seconds. Sprinkle salt over the tuna steak, then rub "five-spice" mix onto the meat to coat it completely.